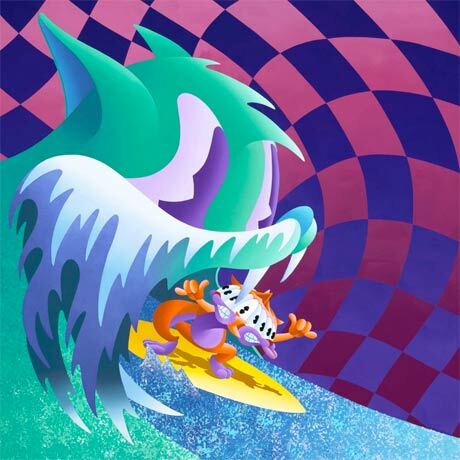 MGMT released their sophomore album, Congratulations, yesterday (April 14). But just because it's officially out there for public consumption, doesn't mean we're clear on that wacky, Anthony Ausgang-designed album cover. In a recent interview with Exclaim!, the band, who picked up surfing while recording in Malibu, opened up about their choice to have what we called "Sonic the Hedgehog lost in some Chester Cheetah nightmare" adorn their record sleeve. "It just kind of felt right, because there are references to surfing on the album, and some of the songs have a surf rock influence," MGMT's Andrew VanWyngarden said. "For whatever reason, I'm still dreaming about surfing all the time, and waves, and I don't really know if there's symbolism there, but I think it's pretty easy to interpret our album cover as feeling a little overwhelmed by this kind of beast that we created that we hadn't really intended to create. We feel like the cat on the surfboard sometimes: about to be swallowed up by it." He continued, "I guess the most obvious interpretation of the cover is the phrase 'wave of success' [laughs]. It wasn't that strategic of a cover, but I think the surfing metaphor does work well with how we feel about things." To express it as an equation: Overwhelming fame + surfing + Anthony Ausgang = Congratulations album art.